How does an American band from deep in the heart of Texas end up signed to the major German independ label Nuclear Blast? Beats me. 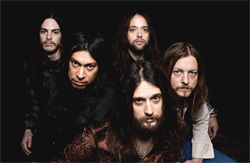 Perhaps the better question is, how were they persuaded to sign a band that plays old school heavy psychedelic rock? It's not exactly a popular genre in today's musical landscape. More head scratching. 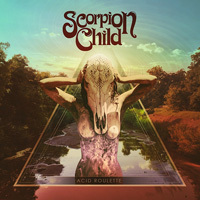 Acid Roulette is Scorpion Child's second long player for the label. Prepare to be warped back in time. Think Seventies, and Led Zeppelin, Free, Cream, or Bad Company on acid. After all Scorpion Child calls their music heavy rock, acid rock. Long humongous hair and massive facial hair applies. That, and a heavy bottom end from a thundering and steaming rythm section that stomps hard on central Texas clay. To make the hammer faster, they may even add some speed as with Winter Side Of Deranged or Tower Grove. (Love that crazy title.) Pile on blistering, often fuzzed out, riffs and add some old school heavy keyboards or drop in some blues. Blind Man's Shine sure sounds like Led Zeppelin was drinking Scorpion Child's acid Kool-Aid. One thing's for sure, there no amount of stillness on Acid Roulette. Well, there's the creepy incantation of Seance. (I skipped it each time.) Nope. Scorpion Child is heavy psych rock by definition. They're in your face from the start and jamming like it's their last record. Maybe they should rename their album to Acid Roulette and Damn Relentless. Scorpion Child is heavy psych rock by definition. They're in your face from the start and jamming like it's their last record. Maybe they should rename their album to Acid Roulette and Damn Relentless.